Plans call for the Cruze diesel coming in 2013 to achieve fuel economy in the range of 50 mpg, company insiders tell Ward&#8217;s.
General Motors thinks a sizable segment of U.S. car buyers want more than just fuel economy from a diesel engine, making the business case for an oil-burner in the Chevrolet Cruze when the nameplate already has the high-mileage Eco variant in the market. But just in case, plans call for the Cruze diesel coming in 2013 to achieve fuel economy in the range of 50 mpg (4.7 L/100 km), sources at the auto maker tell Ward’s. 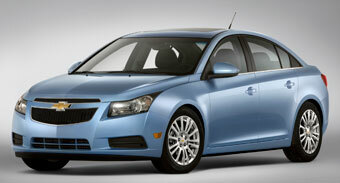 GM also confirms the diesel engine planned for the Cruze is the 2.0L currently on sale in Europe. Ward’s first reported GM’s plans for a diesel-powered passenger car last year. The auto maker already markets the Cruze Eco, a gasoline variant of the popular compact car achieving through mostly aerodynamic and transmission tweaks 42 mpg (5.6 L/100 km) on the highway, according to the Environmental Protection Agency. Having a pair of fuel-sippers under the same nameplate recalls GM’s unsuccessful mild-hybrid Chevy Malibu and Saturn Aura. The cars flopped because 4-cyl. models achieved equivalent fuel economy and cost less, which meant consumers clearly were buying with an eye on pump prices, not necessarily environmental stewardship. The 2.0L turbodiesel GM sells in the Chevy Cruze in Europe comes mated to either a 5-speed manual transmission to achieve 42 mpg in the European combined test cycle or a 6-speed automatic for a 35 mpg (6.7 L/100 km) rating. A version with the manual gearbox tuned for optimum efficiency reaches 43 mpg (5.5 L/100 km). Maximum power in its current applications is 147 hp and 236 lb.-ft. (320 Nm) of torque. Charlie Klein, director-global mass, energy and aerodynamics at GM, tells Ward’s at an industry conference the auto maker thinks a diesel Cruze will be a hit because it will use the automatic transmission favored by Americans. To get 42 mpg in the Cruze Eco, buyers must choose the 6-speed manual. Eco models with an automatic gearbox achieve a peak 39 mpg (6.0 L/100 km). About 25% of buyers choose an Eco version at $19,995 for a manual and $20,990 for the automatic. A standard ’12 Cruze dressed in LTZ trim costs $23,860. Joseph Lescota, chair of the Automotive Marketing Management Dept. at Northwood University in Midland, MI, thinks a diesel Cruze will draw buyers. “Chevrolet has a great price-point vehicle that has tremendous eye appeal and options but may not meet the performance needs of a select market group,” he tells Ward’s. A diesel version would hit that group between the eyes by adding a sturdy engine, extra torque and top-end performance to the mix, he says. But consumers still will have to look beyond the price at the pump, where diesel fuel has been averaging between $0.20 and $0.30 a gallon more than gasoline. Diesel can be difficult to find. About 50% of U.S. filling stations carry the fuel. And diesel also is equally susceptible to spikes, evidenced by a $0.70 premium over gasoline in July 2008 when prices set records. Diesel lovers argue their engines actually are less expensive because they last longer, and the greater energy density of diesel fuel means lower annual fuel costs. “People often tell me, ‘Hey, I bought a diesel because I’m cheap,’” says Allen Schaeffer, executive director at the Diesel Technology Forum, a group backed by makers of diesel-engine technology such as Bosch. “Diesels provide long-term benefit and value,” he says. GM sees just one volume player in the diesel passenger-car segment. About 39% of Volkswagen Jetta buyers in the U.S. pick the optional 2.0L 4-cyl. TDI. Diesel engines currently comprise about 3% of all U.S. light-vehicle sales, according to Ward’s data. Consultant J.D. Power forecasts diesel’s share will rise to 7% by 2016, although gasoline-powered hybrids will grow at a faster clip, from 3% today to 8% in 2016, when new federal fuel-economy rules reach 35.5 mpg (6.6 L/100 km). But while hybrids carry a price premium of up to $10,000, diesel engines cost between $1,000 and $4,000 more than gasoline-powered vehicles, J.D. Power says. Bosch estimates diesel technology pays for itself within 18 months of purchase, due to fuel savings and less maintenance. Greenhouse-gas emissions are 20% less than gasoline because of diesel’s greater efficiency, the supplier says. Surprisingly, buyers cite functionality, or power, performance and capability, as the No.1 reason for choosing a diesel, according to Schaeffer’s data. That’s ahead of fuel economy and environmentalism. “People are thinking more about how they invest their transportation dollars,” he says. For Reuss, diesel power makes good business sense in an era of volatile fuel prices and an unpredictable economy. “It is a really good hedge against the unknown,” he says.